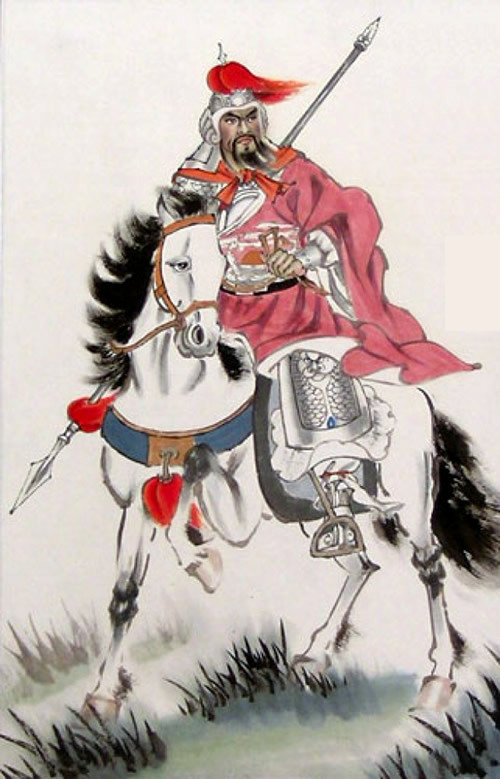 Yue Fei is one of the most famous and admired figures in Chinese history. His parents were farmers in present day Henan (Honan) province. Growing up he was acutely aware of the brutal power of the nomadic Jurchens, who frequently raided his region. In 1122 he joined a daredevil corps of the army. In 1127 the Jurchen Jin (Chin) dynasty sacked Kaifeng (K’ai-feng), the Song (Sung) dynasty capital, carrying off to the wilds of Manchuria Song; Huizong (Hui-tsung), his heir; and 3,000 members of his family and court. One of Huizong’s younger sons escaped capture and rallied loyalists in resistance against the Jurchens, retreating to South China, until they established a government in Hangzhou (Hangchou) near the coast in modern Zejiang (Chekiang) province 10 years later. They campaigned against local bandits who had risen in the wake of the collapse of central authority, earning gratitude of people in affected areas. They also took the offensive aggressively against Jin troops, recovering lost territory into the Yellow River valley, raising morale among the Chinese and hope of recovering lost lands. 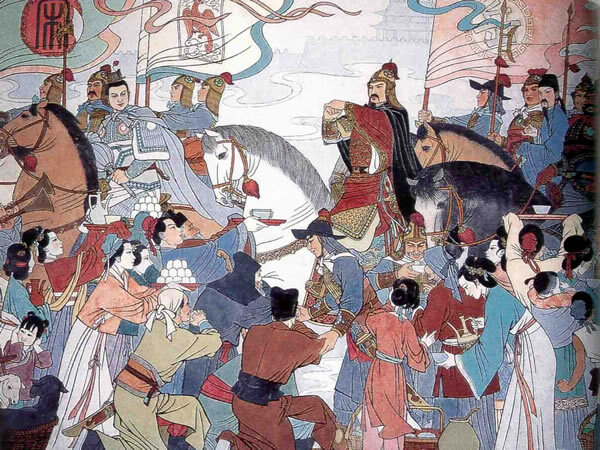 Yue’s actions and popularity did not suit Gaozong and his chief councilor Qin Gui (Ch’in Kuei), who secretly began peace negotiations with the Jin in 1138, because his successes stood in their path. Gaozong might have been genuinely doubtful of ultimate success in war. He also stood to lose personally if Yue defeated the Jin and forced them to return the captive Huizong and his heir (who was Gaozong’s elder brother, and therefore the rightful ruler). Qin Gui was by all accounts a power-hungry politician who staked his future on peace with the Jin, who may have demanded Yue’s elimination as their condition for peace. In 1141 Yue was relieved of his command (as were several other successful anti-Jin generals) and jailed for insubordination and malfeasance. No credible evidence could be produced against him, so Qin Gui gave an order to have him poisoned in jail, and his eldest son, a promising young officer and a key lieutenant, was executed. His widow and remaining children were sent to harsh exile. The Song government destroyed most documents concerning his official career. Qin Giu retained power until he died in 1155. In 1661 changes in court politics led to the total rehabilitation of Yue Fei and surviving members of his family returned from exile. Yue’s body, secretly taken from the prison by sympathetic jailers, was exhumed and buried with honor. His wife was also admired for helping the families of those who served under him, and for keeping the family together after the tragedy of his death. Popular opinion made Yue a semimythical figure, Gaozong less than a filial son and courageous leader, and Qin Gui and his powerful wife despicable moral cowards.